TRTC class C341 electric subway train. A C341 unit consists of 3 permanently coupled cars, a motorized car in each end and a trailer car in the center. This train consists of 6 cars, which are two such C341 units coupled. Driver's stand with digital and modern analogue speedometers and manometers (pressure gauges). 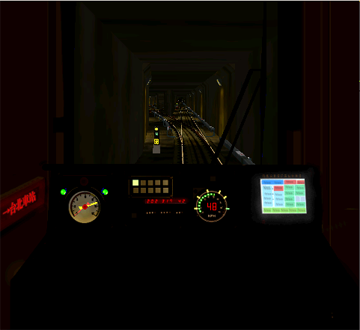 In OpenBVE the train's cab view is to low, at the rail level, and cannot be higher. The train also does not move while the brakes are off and power is applied. The train is made for BVE 2, but also works with BVE 4. Does not work with OpenBVE. The train is no longer available from the creator's web site, which has disappeared from the Internet >10 years ago. Send mail to info@openbve.net for further information on where to get this train.